Division 1 Féminine action returned in Week 10 after the international break and all eyes were on the top of the table clash. The first of two potential title deciders occurred on the final match of the weekend as Paris Saint-Germain welcomed rivals Olympique Lyonnais to the Stade Jean Bouin. PSG showed their intent early on as they pressed high and looked to force the OL backline into mistakes. That tactic paid off as in the 15th minute, the home side opened the scoring. Sarah Bouhaddi came out with the ball as she tends to do, and her pass was intercepted by Shuang Wang who then had the easy task of finishing into an empty net. OL were undeterred and found an equaliser in the 19th minute as Wendie Renard scored a towering header off of Dzsenifer Marozsán's free kick. There was some controversy in stoppage time as Eva Paredes clearly brought down Ada Hegerberg inside the area but the referee waved away her claims. PSG had their chances especially in the first half but in the second half, they had their goalkeeper Katarzyna Kiedrzynek to thank for keeping the score at one all. There are still many matches to go including the reverse of this fixture but right now, OL look unstoppable as today's result was the first time they had dropped points all season. Montpellier HSC turned on the style at home and thumped a struggling Rodez AF by five goals to nil. After a long wait, Clarisse Le Bihan started things off in the 39th minute as she beat two defenders to the ball and slid it home from after a rebound from a previous shot. Janice Cayman made it two in the 54th minute after a clever one-two between herself and Nérilia Mondésir and Le Bihan got her second three minutes later. Le Bihan then completed her hat trick in the 67th minute with a well-taken finish, giving her three goals so far this season. Substitute Solène Champagnac then completed a great day for Montpellier in the 84th minute who hit the crossbar with her first effort before scoring her own rebound. This was a welcome win for Montpellier who have struggled by their standards this season. Anything less than a big win against a side like Rodez would not have been greeted well by the home fans and the win pushes up the table into seventh. Rodez continue to be woeful this year, with no wins and two points to their name this season. They are now likely relegation candidates. Fleury 91 picked up their third win of the season with a tough 3-2 win over Dijon FCO. The match did not start well for the hosts as Léa Declercq put Dijon ahead in the 11th minute and Tatiana Solanet converted a penalty in the 27th minute to make it two for the visitors. Julie Machart-Rabanne pulled one back for Fleury one minute later as she intercepted a pass by Solanet and finished well past the goalkeeper. The second half saw Fleury reach a new gear as they took control of the game. Marie-Charlotte Léger pulled her team level in the 56th minute and Nadjma Ali Nadjim scored a late winner to give Fleury all three points. Fleury 91 move up into fifth with the win this weekend and return to winning ways after failing to do so in their last four matches. Dijon slide into eighth and have now failed to pick up three points in four games. FC Girondins de Bordeaux stopped a run of four straight losses with a win away at Lille OSC. Defender Kathellen Sousa Feitoza put Bordeaux ahead in the 48th minute after a scoreless first half as she met Claire Lavogez's corner close to the six yard box. Viviane Asseyi then made sure of the win for Bordeaux in the 65th minute after picking up a pass from Andréa Lardez and then proceeding to place the ball into the back of the net. Bordeaux now move into fifth, halting their downward slide and will look to keep their change of fortune going in the next match week. Lille remain in tenth, one point above the relegation zone and will know that they are by no means safe at the moment. FC Metz produced a surprising performance to draw against Paris FC away from home. Linda Sällström continued her strong start in Paris with a goal in the 16th minute and Paris stayed ahead for the rest of the first half. The half time break did wonders for Metz though and they were level again in the 52nd minute thanks to Leah Khelifi. 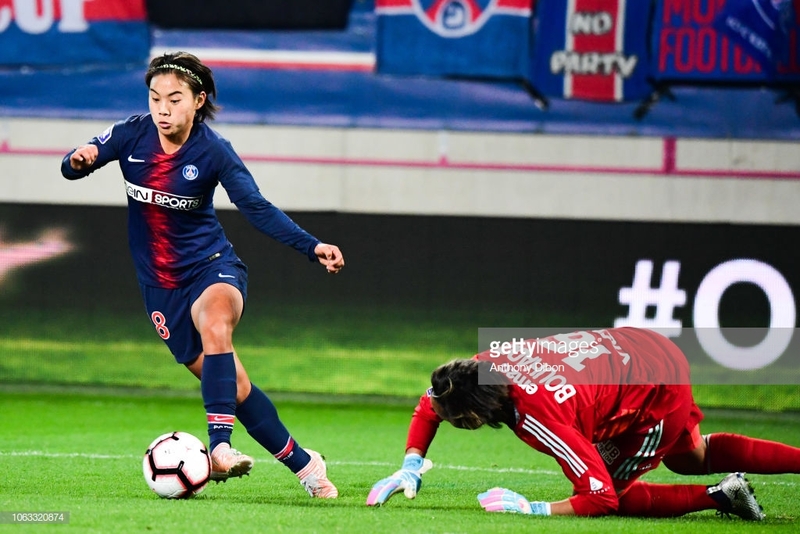 Clara Mateo must have thought she had won it for Paris in the 78th minute but Metz did not go away and got a second equaliser in the 86th minute thanks to Marie-Laure Delie, insuring they came away from Paris with at least a point. Paris are in third but will not happy with letting this game slip away from them when they were so close to finishing off this game. Metz on the other hand, will be delighted with the draw. They stay in eleventh but are now one point from safety and if they can keep surprising teams with performances like this one, they could make a run up the table. ASJ Soyaux and En Avant de Guingamp could not find a winner in their match up this weekend and ended up with a one-all draw. Adélie Fourre pounced on some confusion inside the penalty area in the fourth minute during a corner kick and put the ball in from close range. Anna Clérac then put Soyaux back in the game on the 23rd minute as she capitalised on some poor defending by Guingamp and thumped the ball home with a cool finish. Soyaux have not won a game in their last five games and stay in ninth, three points away from the relegation zone while Guingamp slide into fifth, although still in a good spot in the table right now.